Rick and partners Pathways, the YWCA, and the Rotary Club created Trinity Place. "I came to believe that this is a real problem that the vast majority of people in our community choose not to see." I just gave a $4 million apartment complex for homeless women and kids to the YWCA. Let me explain why. I know vacation travel is supposed to provide a break from the grinding reality of our workaday lives. But for me, travel and the peace of mind of having a roof over your head have always been associated. Before "Europe Through the Back Door," my travels were "Europe Through the Gutter." Slumming through Europe as a teenage backpacker, life for me was the daily challenge of finding an affordable (i.e., free) place to sleep. With my rail pass, I'd sleep on a train four hours out, cross the tracks, and sleep four hours back in. I'd sleep on a ferry (covered by the rail pass) between Stockholm and Helsinki on successive nights to afford spending entire days of sightseeing alternating between the two most expensive cities in Europe. I'd sneak into my friends' hotel rooms and sleep on the floor (restlessly and stressed-out...but free). I'd sleep free on the pews of Greek churches, on the concrete floors of Dutch construction projects, and in barns at the edge of unaffordable Swiss alpine resorts. How else would a white, middle-class American kid gain a firsthand appreciation for the value of a safe and comfortable place to sleep? I traveled in Central America, where I learned civil wars that I thought were between communists and capitalists were actually between obscenely rich oligarchs and landless peasants. I hung out with poor Christians who took the Biblical Jubilee Year (the notion that every fifty years the land is to be re-divided and debts are to be forgiven) seriously...even though rich Christians assumed God must have been kidding. Back home, one of my pet social causes has long been affordable housing. Twenty years ago, I devised a scheme where I could put my retirement savings not into a bank to get interest, but into cheap apartments to house struggling neighbors. I would retain my capital, my equity would grow as the apartment complex appreciated, and I would suffer none of the headaches that I would have if I had rented out the units as a landlord. Rather than collecting rent, my "income" would be the joy of housing otherwise desperate people. I found this a creative, compassionate and more enlightened way to "invest" while retaining my long-term security. This program is designed so the donor could eventually take back control of the land and retire on it (by selling it or renting the apartments). I was committed to providing the apartments to the YWCA for 15 years. Any time after that point, I could take back control if I wanted or needed to. I enjoyed the security of knowing I had that equity if I needed it. And I figured I'd likely be doing well enough that eventually I'd donate it entirely to the YWCA. With the election of our president in 2016 and the rise of a new, greed-is-good ethic in our government, I want to be more constructive than just complaining about how our society is once again embracing "trickle-down" ethics, and our remarkable ability to ignore the need in our communities even as so much wealth is accumulated within the top one percent of our populace. I'm heartbroken at how good people, dedicating their lives to helping others (through social organizations and non-profits across our society), are bracing for a new forced austerity under our government of billionaires. So, inspired by what's happening in our government, and in an attempt to make a difference, I decided to take my personal affordable housing project one step further: In 2017, I gave my 24-unit apartment complex to the YWCA. Now the YWCA can plan into the future knowing this facility is theirs. And I'll forever enjoy knowing that, with this gift, I'm still helping them with their mission. The gap between rich and poor in our country continues to widen. And I believe needs — such as affordable housing — will only increase as budget cuts are implemented. Organizations like the YWCA will need to pick up the slack. If our country truly wants to be great, we need creative thinking connected with our hearts. And it's my hope that love and compassion can trump values of crass commercialism, greed, and "winners" beating "losers." As a man (in a male-­dominated world), I take partial responsibility for the plight of women abandoned by their husbands to raise children alone. The YWCA works very effectively in my community with exactly that problem as its focus. For me, the YWCA is not a charity. It's a service. I pay them to translate my excess productivity into fighting this problem. Since I've already consumed all I really need, this gives me the treat of vicarious consumption. It's a fun way to consume beyond my capacity. As a businessman, I feel it's a responsibility to make a real commitment to my community. And, it's my hope that a project like this — utilizing a local agency like the YWCA as a service more than a charity — will inspire business people to think creatively about making a real difference this way. In a time with greater human need and lesser return on conventional investments, simply redefining "returns" suddenly makes this a smart use of capital. As a Christian, I believe in tithing. And as a Christian businessman, I think a business can have this kind of giving as a goal, too. A business has a lot of potential for good in its community. In my creative charitable initiatives, I hope to inspire other business people to do more than conduct canned-food drives. As an American and a liberal, I'm tired of hearing people say, "There's not enough money." With any honest assessment, there is enough money. In fact, there is more money than ever. But we as a society have different priorities. As a Democrat, I believe providing affordable housing (like health care and education) is a responsibility of society in general — implemented efficiently by government. But I'm willing, for now, to proceed in the "thousand points of light" and "faith-­based" Republican style that prefers to let the people who really care handle the problem apart from government involvement. However, I do this under protest. I believe this can and should be performed most fairly and efficiently with governmental initiative by society as a whole. In short, an enlightened society brightens its world in unison through smart government and doesn't need a thousand points of light. The Financial Arrangement: Smart Investing — "Dignity on $5 a Day"
The original plan: I provide and own the apartment complex. YWCA and the Rotary club see that the units are renovated and fit to house clients of the YWCA. The YWCA will manage the project in a way where I have no risk, no expense, and no income for 15 years. During this time, they'll charge a small rent to its clients who stay in Trinity Place in order to have a budget covering taxes, insurance, utilities, and general maintenance. I own the buildings and have the option to take them back for my own non­-charitable use after 15 years, with a one-year notice. This isn't altruism, it's just awake. On a smaller scale, an affordable housing investor could invest $300,000 in a simple duplex; then let their church or local homeless organization use the property. Rather than, say, earning $14,000 in taxable interest (about $9,000 after tax annually) by keeping that money in stocks or the bank, you're housing two families — six people. Real people being housed by you for $1,500 a year or $5 a day each…what a wonderful kind of passive income. 1980s — After reading progressive books on hunger and homelessness (like Frances Moore Lappe's "Food First," Noam Chomsky's "Manufacturing Consent," and Arthur Simon's "Bread for the World"), I saw how structural poverty was an almost invisible but very real by­product of American capitalism, both within our country and abroad. 1990s — The duplex's three sisters on the same street went up for sale — each at an opportune time for me and my vision — and by the mid-­1990s I had eight units in four duplexes in use, managed by the YWCA and housing homeless single mothers and their children. 2000 — Eventually the buildings developed a mold problem and became uninhabitable. We realized that if we were to ever have these buildings usable again we'd need to invest lots of money in a cleanup. But to me, this was actually good mold. God was in that mold. After much thought the right move became clear. I'd tear down the duplexes and replace them with four­plexes, doubling the people I could house and creating a little community I'd call Trinity Way. 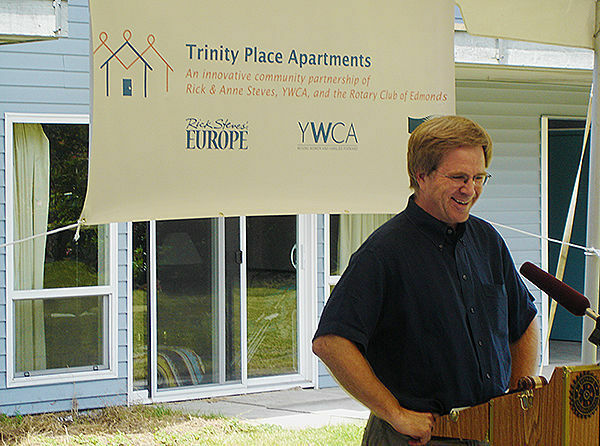 2001 — Trinity Way: A YWCA/Rotary Club/Steves Collaboration. Until now this project was simply me offering the use of the duplexes to the YWCA. This new vision was to solely finance 16 new units, deal with zone changes, plan thoughtfully, and oversee the construction. While I would provide the land and all the cash for the project (building four fourplexes), my partners were providing substantial and essential services, without which Trinity Way could never happen. I would promise the free use of our buildings for 15 years. The Rotary club joined in to motor the project to completion with their many talented members (architecture, project management, city relations, landscaping, furnishing, and so on). And the YWCA would manage the project with an obligation to use the buildings to their absolute maximum capacity. 2002 — Defeated by Modern Building Codes. My hope was to build Trinity Way for my $1.5 million budget. I demolished the old duplexes, hired an architect, contracted with a builder, and barreled ahead with my vision. Slowly it became clear, modern American building codes simply do not allow for basic utilitarian construction to provide safe and comfortable, yet sparse, temporary housing for homeless people. The buildings, the land…even the sidewalks needed "contour" so they would look nice. Landscaping requirements chipped away at play zones. Financial setback after setback drove the price up until a $200,000 drainage requirement drove the building price to over $2 million. That finally sealed the fate of the project. It was no longer a wise use of my limited capital. 2004 — A New Direction: Renovate an Existing Apartment, "Trinity Place." Rather than invest $2 million plus the land for 16 new units, I decided to look for existing apartment buildings (which would enable me to buy into the standards of an age with simpler codes). Trinity Way became Trinity Place. 2005 — I located a 24-unit complex for nearly the same amount of money (and that came with land to boot). Back on track, my vision — born in El Salvador, and matured with a long march through church meetings, mold, and suburban Seattle zoning codes — was finally within reach. The location of Trinity Place couldn’t be handier for people in transition (good access to public transit, groceries, Edmonds Community College, church). 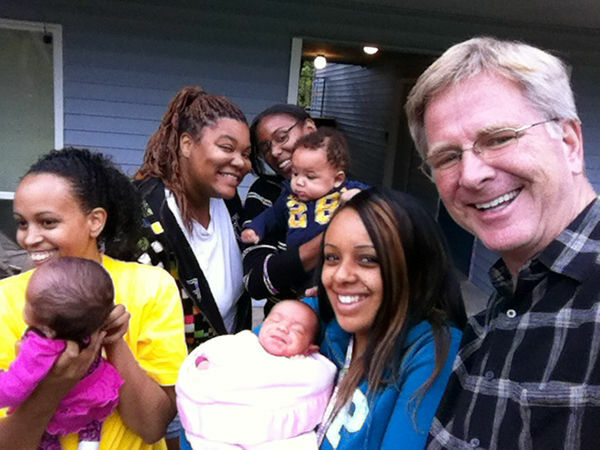 Purchasing the apartment in April, my partners (the YWCA and the Rotary Club of Edmonds, with some help from the Gates Foundation and local government) renovated the units and we’re housing single mothers and their children by Thanksgiving. 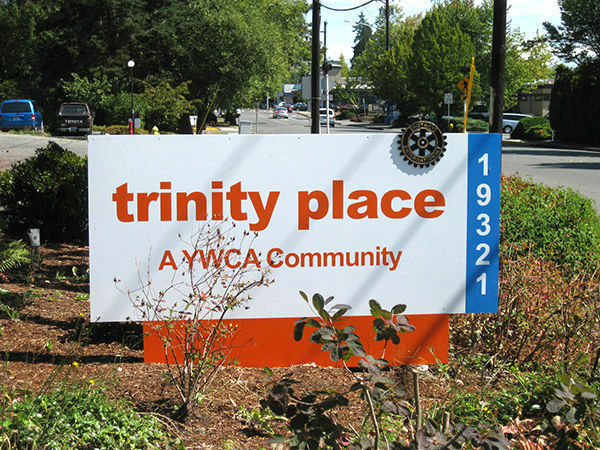 2005–2016 — Trinity Place is up and running, beautifully managed by the YWCA and at nearly full capacity during that period. 2017 — I decide not to wait for my will to kick in but to experience the joy of giving Trinity Place to the YWCA while I'm still alive. From now on — The YWCA will keep helping single moms and their kids by running its Trinity Place.